A hairbrush that’s known for being good to your hair, its gently detangles with minimal breakage to the hair. 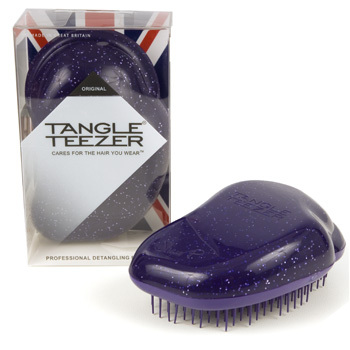 The Tangle Teezer is available in a wide variety of colours- I have the sparkly purple one. There really isn’t a huge amount to say about this product – it is simply a brush. Everyone knows (or should!) how to brush their hair, the point of this product however is to make brushing your hair less damaging, even when wet. As far as I can tell, this makes combing my hair out after I’ve washed it an absolute joy. Simply pull the brush gently through your hair, starting with the ends and working your way up to the top. I used to use a wide toothed comb which was also effective but took longer, this product however, is much easier, quicker and nicer to hold as its nice a chunky but incredibly light. This product costs around the £10 mark which I realise may seem a lot to some people for what is effectively just a hairbrush. Having said this, it really does do what it advertises and I would seriously recommend it for those of you with curly hair which I know can be very hard to manage. Added to this is that it is really a one time purchase if you look after it. I’ve had mine for over 6 months and have seen no difference in its effectiveness. This product is available from several shops including Boots but there are many online stores where you may be able to get an even better deal – Amazon is always a good one. 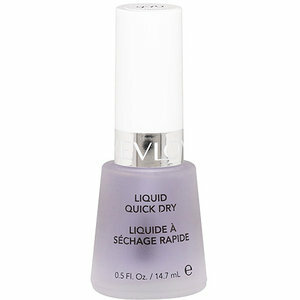 A liquid, brush on oil that dries wet nails in less than a couple of minutes. This product is a life saver for me, I like to paint my nails but I’m also very impatient when it comes to letting them dry for long enough. It’s easy to use and absolutely amazing! Just paint your nails as usual and apply your top coat, allow this dry for about 30secs just so it’s not super wet and lightly brush on the Liquid Quick Dry. This is a a runny liquid as it’s a fairly thin oil so you do not need to really push the brush as you brush on the product. I find that roughly three, quick, light strokes coats the nail and after about 90secs it’s completely dry and has no effect on the polish’s ‘natural’ finish. A nail technician at a photoshoot the other week used it on me so of course, if it’s good enough for a pro then this stuff definitely is worth the money! It works really well and is hardly an investment buy at £6.49 – compared to some of the other ones out there from brands such as OPI it’s an absolute bargain. A top selling mascara that promises to lengthen, curl, volumise, lift AND separate. I am a complete ‘drugstore’ mascara kind of girl and never ever felt the need to fork out on high end mascaras. There are some brilliant cheaper ones out there particularly from Maybelline and L’oreal. I decided to try this one only because of the hype surrounding it and the fact that my boyfriend convinced me to treat myself! All I can say is WOW. I am so glad I bought this mascara. 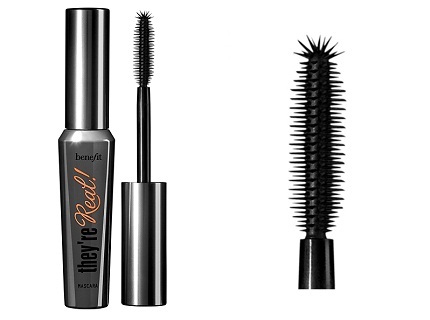 The claims made by Benefit were big ones and this mascara had a lot to live up to but in my eyes (see what I did there…) it certainly did just that. The brush is an absolute delight to use and separates lashes perfectly with hardly a clump in sight and there’s the added bonus on the spikey end to get even the tiniest corner lashes. When I’m wearing this my lashes look amazing and I always get compliments. I also love the fact that unlike other mascaras that give a good dark look, this doesn’t clump and look really spidery and fake. The formula is long lasting, gorgeously deep, stays on all day and doesn’t smudge – perfection! The only thing I will say about this product is that it stays so well that it is more difficult than most other mascaras (even waterproof ones) to take off. However, if you have an issue with finding most mascaras smudge on you then this could be a good one, and of course knowing that its going to stay looking fresh all day is no bad thing! This is a pricey product – it’s £18.50 for a tube and to me it’s worth it as I have a good set of dark lashes but they’re fairly straight and I would like them to be longer. If your lashes are a key feature or something you feel is lacking then this is perfect. This will certainly be a repurchase for me! This product is available from Benefit free standing stores, counters at some department stores such as Debenhams and of course, the official online website. An interesting take on the standard colour manicure. 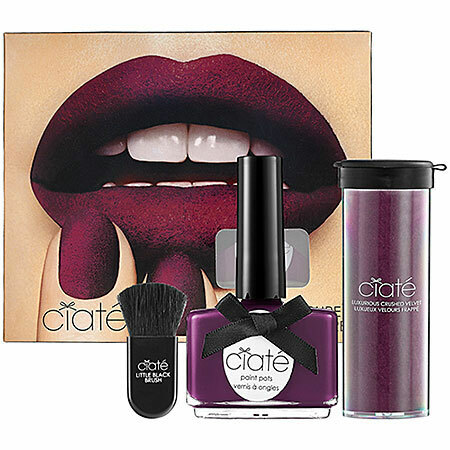 This features a plain base colour and a bottle of matching coloured loose velvet that is shaken over the wet nails and left to set to create a real velvet look and feel to the nails. As with any standard manicure, you would shape the nail, paint on a base coat and then use the coloured polish that comes with this kit and apply two coats. While the second coat is still wet, shake the bottle of matching coloured loose velvet over each wet nail using the tray placed directly underneath the nails to catch the any velvet that misses the nails. Allow the velvet to set for 15 minutes before using the small brush provided to brush the excess velvet into the tray. There is NO need to apply a top coat as this takes away the look and feel of the velvet on the nails. 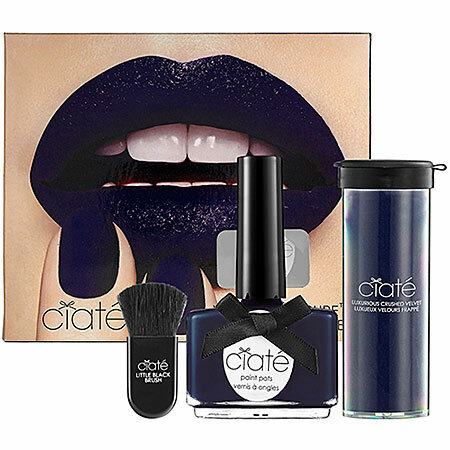 I honestly think this is a really cool idea and a much less bold than Ciate’s Caviar Manicure which I’m sure you’ve all seen! It looks expensive and feels just like velvet. I do however, have a few points to make. I had this done by a professional at a photoshoot on Thursday, it is now Sunday. First of all, although I did not do the application myself, it was still extremely messy, had I done it myself I am certain it would have been far worse! To coat the entire nail you really do have to shake a vast amount of the loose velvet all over the nails and no matter how good your aim is, your hand WILL get covered in it. Secondly, even if you coat your hands/fingers/nails in this messy stuff, you will miss bits. Not necessarily, on the main central part of the nail but getting all around the edges of the colour is tricky and once set the velvet does comes off. I have found the velvet started to come off after only a couple of hours of wearing it, and I was being careful for fear this might happen. I have also found that it doesn’t come off evenly on both hands. As is logical, the nails on my right hand are much barer than my left hand because I am right handed and so I use this hand an awful lot more than my left. The last point I have to make is this; the velvet manicure is not very practical. Most girls I’m sure love a bit of something different and I adore how this looks on my nails, it’s chic, it’s expensive looking and it is completely different to anything else I’ve seen but it just doesn’t stay looking this great for very long. In reality, its like wearing carpet on your nails; stuff gets on it and that stuff stains it. I have been no messier than usual at applying my everyday make up and yet I have patches of velvet nails that are now tainted with the shade of my foundation … Not so pretty. If you have a special event then this is great! I will be buying this when it hits the UK but I will be saving it for parties/events etc as it only stays looking tip top for a couple days. I do honestly love how it looks and feels but for every day wear, it’s messy to apply and impractical if you want it to stay looking nice. I believe this set is not yet available in the UK but will be at some point this month. The set will be exclusive to Selfridges and I believe it’s going to be around the £15 mark. This product is, however, available now from Sephora. Just a quick snapshot of my Ciate Velvet manicure. I was shooting a beauty story for a magazine the other day athe the last shot included this gorgeous velvet mani.